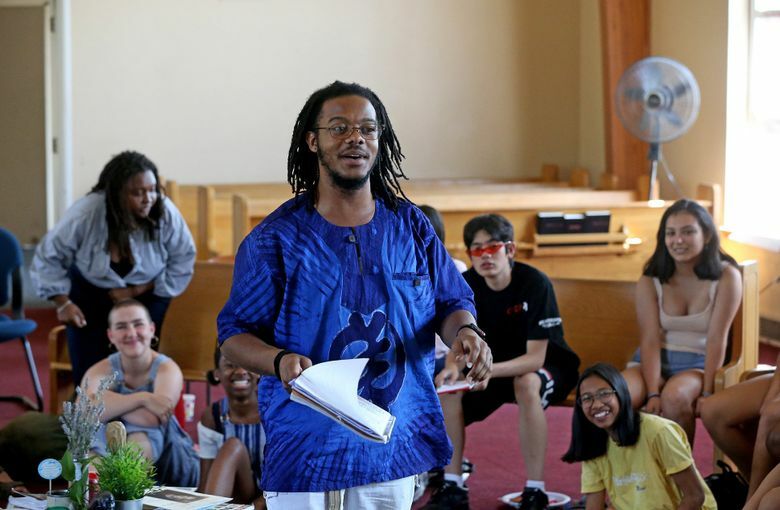 In the sweltering heat of Bethany United Church of Christ’s sanctuary, youths ages 11 to 24 are sacrificing a week of summer to experience an immersive anti-racist education. 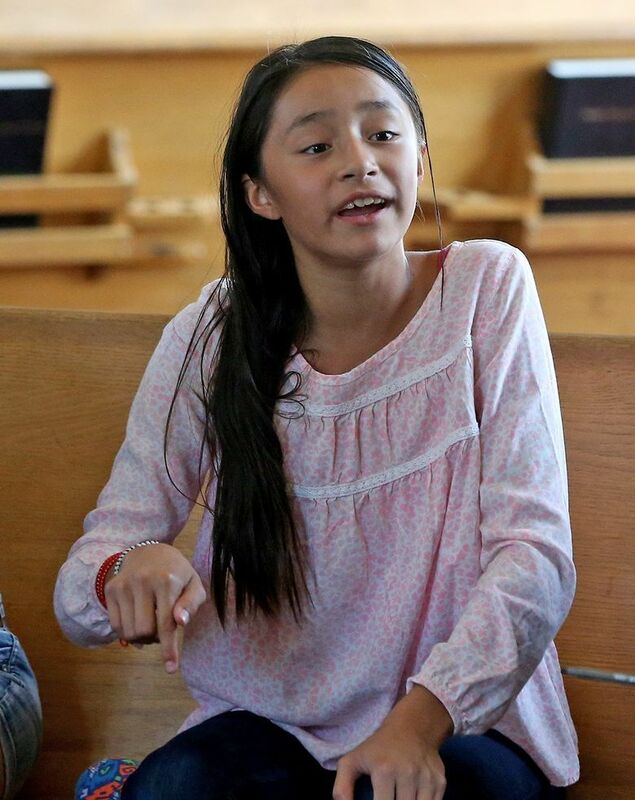 Eleven-year-old Ariana Martinez is desperate to exterminate racism. 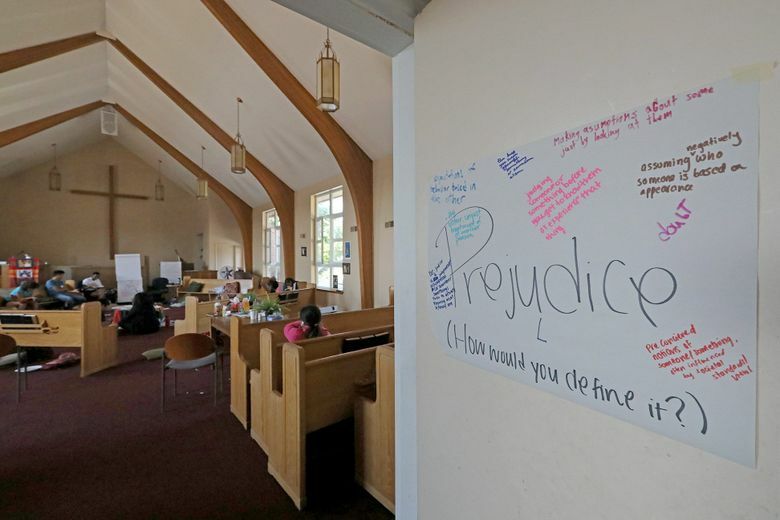 In the sweltering heat of Bethany United Church of Christ’s sanctuary, she and 50 other classmates — ages 11 to 24 — are sacrificing a week of summer to experience an immersive anti-racist education. At the Tyree Scott Freedom School, a summer program named for the late Seattle labor leader and civil-rights activist, children and young adults come together for a curriculum not normally taught in public schools. 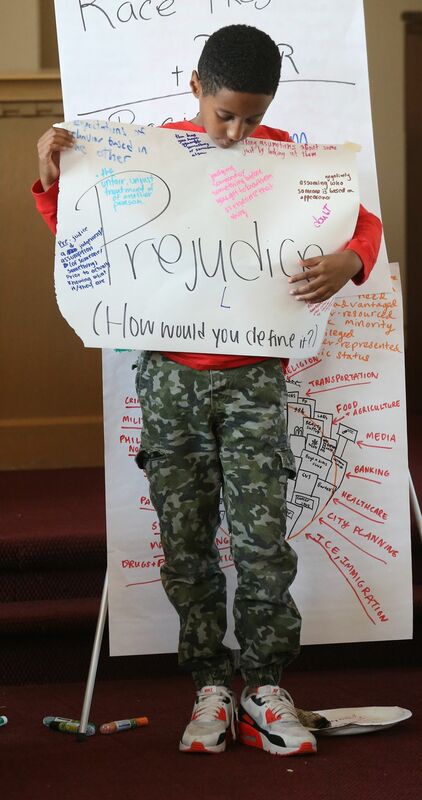 All take turns answering why racism must urgently be dismantled. The anagram highlights what the social-justice pop-up school, now in its 17th year, will emphasize over the next five days: At its core, America is a racist society and can only be a truly great nation once it reconciles its contemptible past with its aspirational future. 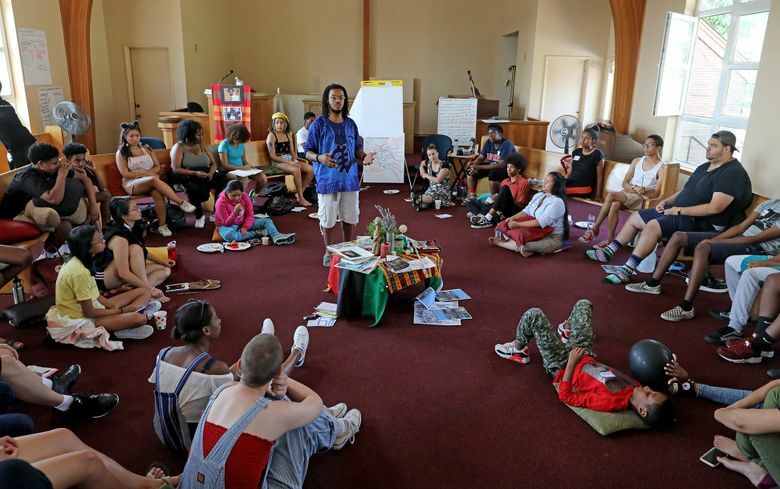 The freedom school’s curriculum derives from anti-racist principles of The People’s Institute for Survival and Beyond, an international collective. It is rich in civil-rights history and cultural exchange. Racially divisive politics have become more pervasive, and police in Washington, D.C., and Charlottesville, Virginia, brace for clashes this weekend — the one-year mark of the deadly white nationalist march in the Virginia city. But hopes in this room haven’t dimmed. 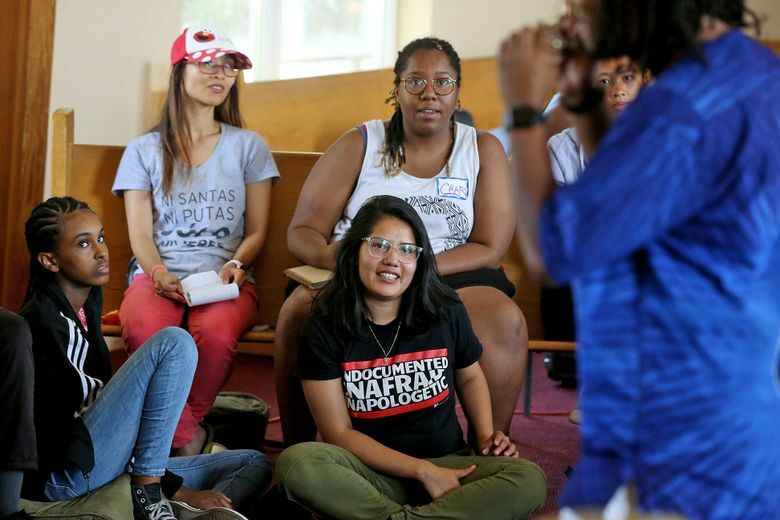 Gabriella Sanchez-Stern, 30, a teacher at the NOVA Project alternative high school in the Central District, first attended the Freedom School in 2005. She credits it with steering her toward her current profession. Sanchez-Stern is not against Seattle Public Schools (SPS) teaching STEM (Science Technology Engineering Math) education. 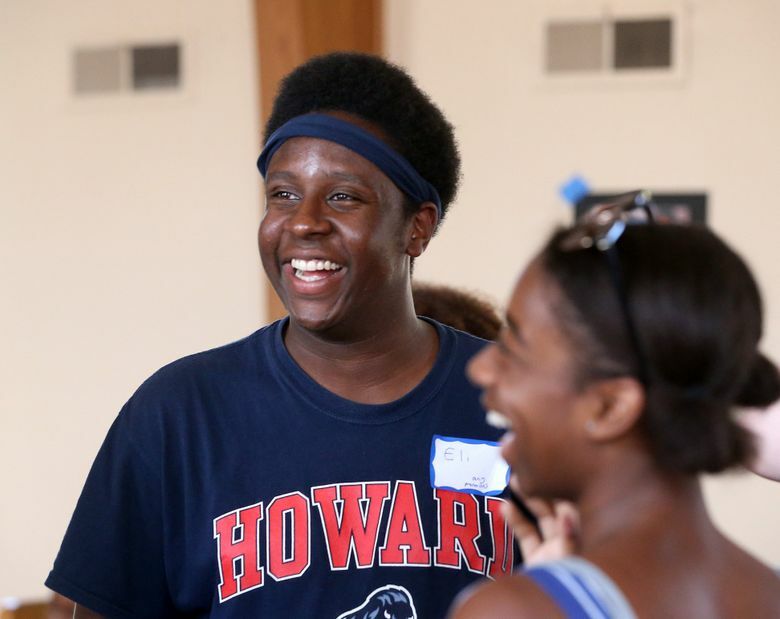 But she and other Freedom School alum and instructors say a curriculum reflects a society’s values, and the education offered at Tyree Scott would benefit all of SPS’ 53,380 students. She also thinks the city’s 724,000-plus residents would benefit. Racially biased crimes have rocketed 302 percent from 2012 to 2017, and they are on pace to increase again this year, according to Seattle Police Department data. “We’re not here to teach kids what to think, but how to think,” says Freedom School lead organizer Senait Brown, 33. The Tyree Scott Freedom School was established by the American Friends Service Committee and anti-racist trainers Dustin Washington and Katie Wepplo. It is funded by AFSC, Youth Undoing Institutional Racism, and The People’s Institute for Survival and Beyond Northwest. It also shares DNA with Seattle’s 1966 Freedom School protest for districtwide desegregation. 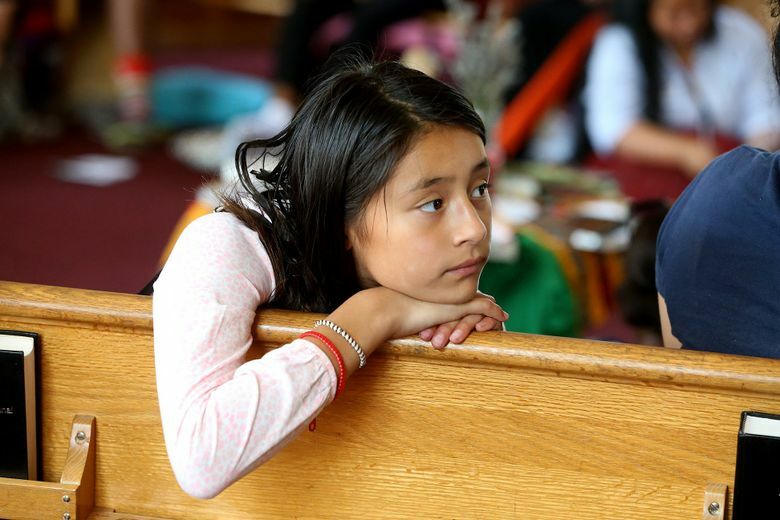 The Children’s Defense Fund supports and WA-BLOC runs Seattle’s other Freedom School, in Rainier Beach. While SPS has made strides to expand its Ethnic Studies curriculum, Brown says that education doesn’t go far enough to equip children with the critical-thinking skills necessary to navigate a racist society. “Most education doesn’t provide kids with a racial or structural analysis of the world they’re living in, so they just accept what they’re told,” Brown says. To illustrate that point, the students participate in an exercise where they must connect three rows of three equidistant dots using four lines. The catch is they can’t lift their pen from their paper. After five minutes of frustration for many students, it’s revealed they can only successfully complete the task by drawing outside the perceived box that the nine dots formed. “Who taught you to look at these dots as a box and that you couldn’t draw outside of it?” ask Derek “Black Moses” Raskins, 27, a Freedom School instructor from New Orleans. “Our teachers,” a student named Tommy answers. “The media,” says another. Raskins explains the box represents our racial and classist perceptions of people. 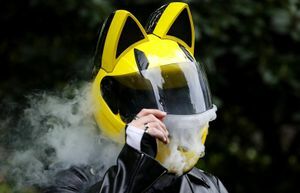 “We immediately default” to stereotypes and biased thinking about ourselves and others, conditioned by society and its institutions, including schools, to do so. People often put themselves in boxes, Raskins says. Rogers records the responses in blue marker on the left side of a white board. She then asks students to shout out labels for an imaginary woman accompanied by three rambunctious children stalled in a grocery store checkout line because the mother’s Electronic Benefit Transfer card has been declined. “She should’ve closed her legs”; “welfare queen”; “ghetto”; “she’s taking advantage of the system”; “who’s the baby’s daddy?” The responses come in rapid succession. Rogers scribbles them down in red marker. The blue side lists “systemic” failures of society, the red “personal failings and assumptions made” of individuals. This builds to the final lesson of the day. 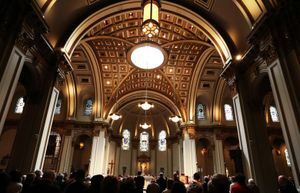 A student comes to the center of the sanctuary and pretends to be walking along the Columbia River, where he encounters a drowning infant (represented by a pillow). He saves one easily, but then dozens of pillows are thrown at him. Unable to grab them all, his attempts become futile. “Now instead of just trying to save all of them, wouldn’t you ask: ‘Where are all these babies coming from? Who or what is sending them downstream?’” asks Brown. The idea, freshly introduced for many of the students, is that an upstream caste system bestows unearned advantages to some while abandoning others to fend for themselves. This seems to land with the weight of an anvil on the assembled youth, as Brown’s words are met with silence. The system produces human carnage. It produces racial disparities in the judicial, housing and economic sectors. It produces a Donald Trump, Brown says. However, these are all symptoms. The system is the cause. Class is over. And though it’s only the first session of a program that will conclude Saturday afternoon, the instructors hope the next Barack Obama, or former U.S. presidential candidate Shirley Chisholm, or Black Lives Matter co-founder Patrisse Cullors might emerge from their doors. “I want to break the box society puts us into,” says Ariana Martinez, who wants to share Freedom School’s lessons with her West Seattle school when classes resume next month.